Join us as we sow into our Marriages and better understand how to relate to our spouse in the way that God intends for us to communicate and have relationship with one another. We will go through this together on Monday nights for the next 5 weeks. The video series will be taken from the “Love and Respect” Marriage conference. You can join us from the privacy of your home as we utilize Zoom video conferencing for this time. You will need a tablet/smart phone/computer and an email address. Pastor Mike and Tifany will moderate the sessions, with a time of sharing and asking questions afterwards. 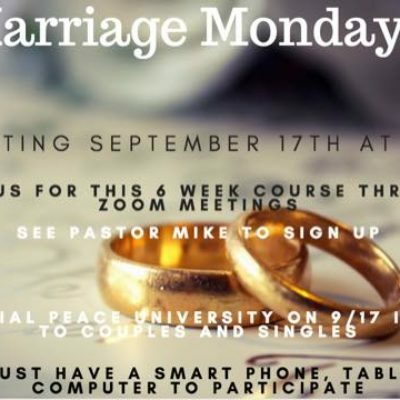 All are welcome to join us (single or married).